The unparalleled possibilities of quantum computers are currently still limited because information exchange between the bits in such computers is difficult, especially over larger distances. FOM workgroup leader Lieven Vandersypen and his colleagues within the QuTech research centre and the Kavli Institute for Nanosciences (Delft University of Technology) have succeeded for the first time in enabling two non-neighbouring quantum bits in the form of electron spins in semiconductors to communicate with each other. 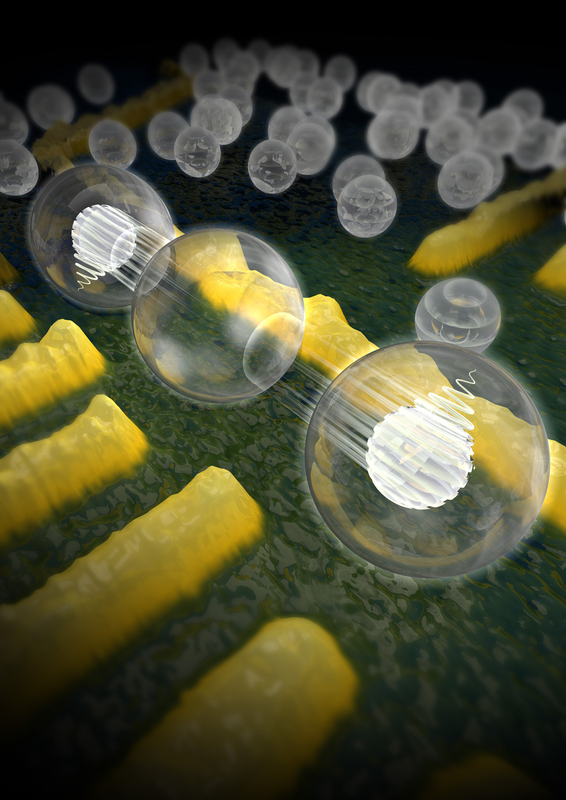 They published their research on 10 October in Nature Nanotechnology. Information exchange is something that we scarcely think about these days. People constantly communicate via e-mails, mobile messaging applications and phone calls. Technically, it is the bits in those various devices that talk to each other. "For a normal computer, this poses absolutely no problem," says professor Lieven Vandersypen. "However, for the quantum computer – which is potentially much faster than the current computers – that information exchange between quantum bits is very complex, especially over long distances." Within Vandersypen's research group, PhD student Tim Baart and postdoc Takafumi Fujita worked on the communication between quantum bits. Each bit consists of a single electron with a spin direction (spin up = '0' and spin down = '1'). "From previous research, we knew that two neighbouring electron spins can interact with each other, but that this interaction sharply decreases with increasing distance between them," says Baart. "We have now managed to make two non-neighbouring electrons communicate with each other for the first time. To achieve this, we used a quantum mediator: an object that can exchange the information between the two spins over a larger distance." Baart and Fujita positioned the electrons in so-called quantum dots, where they were held in position by an electrical field. Between the two occupied quantum dots, they positioned an empty quantum dot that could form an energy barrier between the two spins. "By adjusting the electrical field around the empty quantum dot, we could enable the electrons to exchange their spin information via the superexchange mechanism: when the energy barrier is lowered, the spin information is exchanged," says Baart. "This makes the empty quantum dot act as a type of mediator to make the interaction between the quantum bits possible. Furthermore, we can switch this interaction on and off at will." The research of Vandersypen and Baart forms an important step in the construction of a larger quantum computer in which the communication between quantum bits over large distances is essential. Now that the concept of this quantum mediator has been demonstrated in practice, the researchers want to increase the distance between electron spins and place other types of 'mediators' between the quantum bits as well. Coherent spin-exchange via a quantum mediator, Timothy Alexander Baart, Takafumi Fujita, Christian Reich, Werner Wegscheider & Lieven Mark Koenraad Vandersypen, Nature Nanotechnology, 10 October 2016. Artist impression of two electron spins that talk to each other via a 'quantum mediator'. The two electrons are each trapped in a semiconductor nanostructure (quantum dot). The two spins interact, and this interaction is mediated by a third, empty quantum dot in the middle. In the future, coupling over larger distances can be achieved using other objects in between to mediate the interaction. 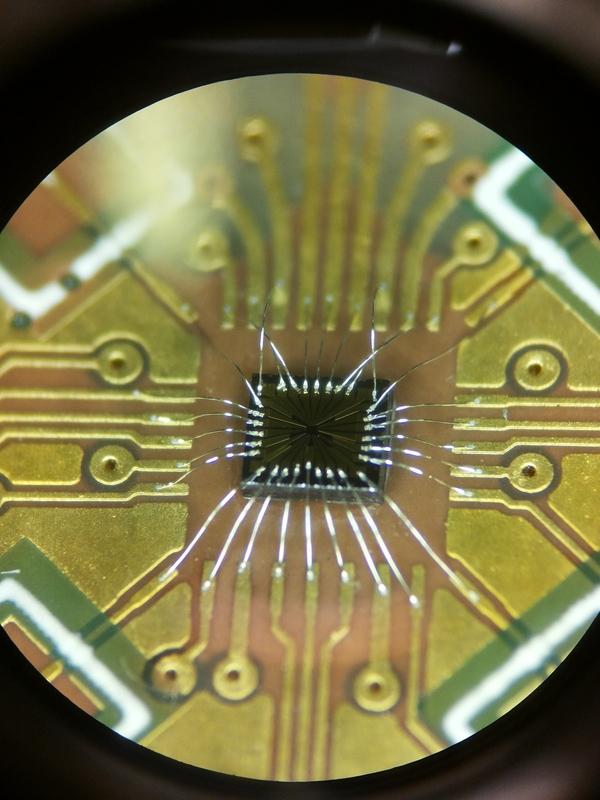 This will allow researchers to create two-dimensional networks of coupled spins, that act as quantum bits in a future quantum computer (copyright: Tremani/TU Delft).